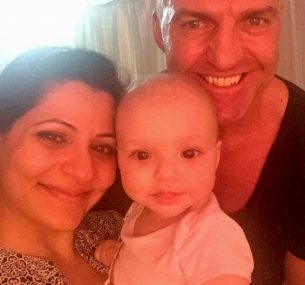 Mia Pyari was diagnosed with acute lymphoblastic leukaemia, at 7 months old in 2017. Her family have set up Mia’s Fund dedicated to improve survival rates of infant leukaemia over the next decade. 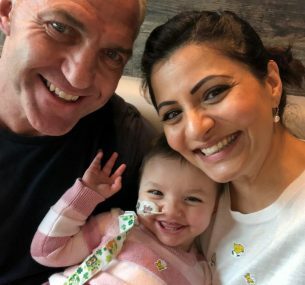 In July 2017, within a moment, our lives were changed forever when our daughter Mia Pyari was diagnosed with a childhood cancer, infantile acute lymphoblastic leukaemia also known as ALL. This was truly devastating and shocking news for us. Mia was only 7 months old at the time. It was like an earthquake hit our lives. This really is the nightmare every parent could possibly imagine but for us it’s now a reality. 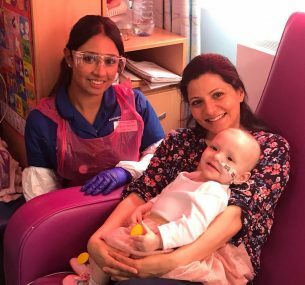 Mia has spent the next 9 months of her very young life undergoing intensive chemotherapy, along with many invasive procedures at Birmingham Children’s Hospital. These left her very sick and distressed as a small baby, at times spending weeks confined within the hospital or isolation rooms, craving some company or fresh air. Due to the nature of her treatment and constant low immune system, she was rarely allowed to go home so, as her parents, we cared for Mia around the clock staying night after night at hospital. Mia spent a significant part of her first 15 months of life in hospital. We celebrated her first birthday, Christmas and New Year’s in hospital. This is not what we ever imagined for her. Even having undergone such a gruelling treatment regime in hospital, whenever she felt well, she would be focussed on laughing, playing, being mischievious and having fun. She hit incredible milestones such as taking her first steps and saying her first words all during her hospital life. Mia was discharged in March 2018 having completed the in-patient part of her treatment. She continues her treatment through a maintenance program which requires her to have chemo drugs every day, but in the comfort of her own home. Mia from the start has shown incredible courage, strength and resilience. It is clear there is nothing stopping her incredible fighting spirit and zest for life. She is a huge inspiration to us. Acute lymphoblastic leukaemia (ALL) is a type of blood cancer. There are up to 400 new diagnoses of ALL every year in the UK in children aged 0 to 14 years. More than half of these patients are under the age of 5 years. Although only 150 infants are diagnosed with leukaemia each year, their prognosis is not very encouraging. Among all childhood cancers, leukaemia in infancy (under age of 1 year) is rare and challenging for researchers and doctors tasked with understanding causes and finding more successful treatments. Until 1960’s childhood Leukaemia was incurable, thanks to improvements in care and sustained investment in research, the outlook for young patients diagnosed with ALL is good with a survival rate of over 80%. However, the survival rate for infants is less than 50 percent to make it to the age of 5. This statistic has not changed or improved over the past 10 years! The Mia Pyari Fund is looking to fund dedicated research with the view of hoping to make a significant improvement in infant ALL within the next decade. Our babies diagnosed with infant ALL deserve better treatments and survival rates. We ask everyone who is touched by Mia’s story to kindly donate money to the Mia Pyari Fund. Life really can change in an instant! We thank you in advance for anything you can give. We wish you happiness and good health. The ‘Mia Pyari Fund’ is a Special Named Fund of Children with Cancer UK. Please give whatever you can to the Mia Pyari Fund. The funds will go directly to vital research into infant acute lymphoblastic leukaemia. Please help to continue the fight to kill this awful disease and wish for an outlook of a 100% survival rate for this age group. Our children are our future. We wish for a day where no parent ever has to go through this painful journey.